If there's a cuter way to store your info, I defy you to find it! This face could be my face because a savory, melty, cheesy snack puts one heck of a smile on my face. This looks like the perfect after school snack to eat when you get home from art club and you need something to nibble on while you watch "Animaniacs" and "Chip and Dale's Rescue Rangers". The first time I ever saw eggs in a basket was in a black and white slapstick comedy from the 40s. I wish I could remember what the movie was. I was watching late at night probably about 12 years ago now and was so inspired by this snack they ate onscreen that I had to make it immediately. It has since become a standby snack that I will eat at any time of day. Nowadays I add Sriracha and maybe some quick sauteed greens and call it lunch. Excuse me, I have to go turn on the stove now. Imaginary toy bears also need to start the day with a balanced breakfast! Considering how much I love butter, if I had a piece of toast that big, a whole stick might just about do it. I don't want to think about my cuts and scrapes, I want to think about breakfast! Though it pains me to see a sweet face on my plate looking so sad and resigned to his fate of being eaten, I have to do what I came here to do and dip him in over medium egg yolks. It's a cruel world. When good bread goes bad, and fights back! I know I just featured eggs in a basket here a while back, but that one wasn't cut in the shape of a heart with little ketchup hearts! If this were my breakfast those hearts would be made of Sriracha but I'm willing to let it go this once. You can thank me later for making your Valentine's Day breakfast one to remember. Silly, you can't use real toast as a wallet! Your money will get butter all over it! 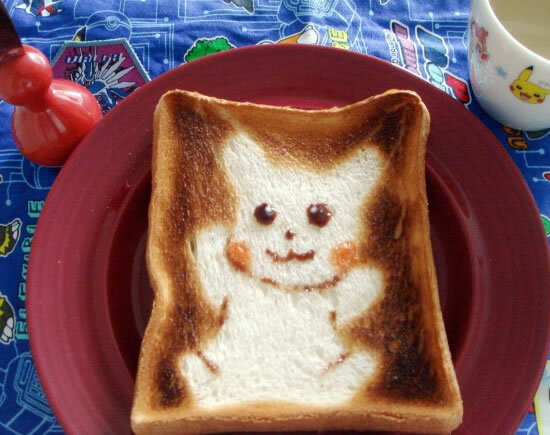 Electrify your morning with a little Pikachu toast!